Imogen's Typewriter. : Series Review: The Southern Vampire Mysteries by Charlaine Harris! Series Review: The Southern Vampire Mysteries by Charlaine Harris! Thirteen books. This is officially the longest series I've ever read. The Southern Vampire Mysteries, also known as the Sookie Stackhouse series or the True Blood series is set in Bon Temps, Louisiana and follows a Telepath; Sookie in a world where vampires have just 'come out of the coffin'. All my original reviews for the books are here; Dead Until Dark, Living Dead in Dallas, Club Dead, Dead to the World, Dead as a Doornail, Definitely Dead, All Together Dead, From Dead to Worse, Dead and Gone, Dead in the Family, Dead Reckoning, Deadlocked and Dead Ever After. Sometimes it's hard to see the wood through the trees, or in this case, the overarching great bits of a series when you're reviewing individual books. This is why I like to do series reviews sometimes when I complete a series because I'm not quite finished talking about them yet. I'll keep it spoiler-free though! 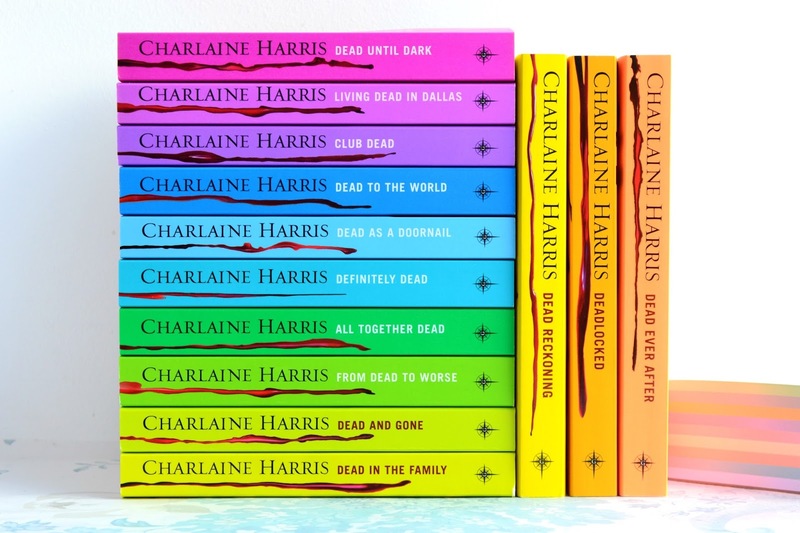 I really like this series, it's not my favourite and there are definitely some books that are better than others but I don't regret the time I spent in Charlaine Harris's Sookie Stackhouse world. It's not for everyone and unlike some series I wouldn't shove the first book into anybody's hands, but here are a few of my favourite things that might convince you to pick the series up. Sookie deals with money issues, friendship problems, men problems. Harris even approaches the issue of sexual assault, something faced by 1 in 6 of American women. Don't let the fact that there are vampires and werewolves distract you from the fact that this is based in a contemporary world where being a barmaid doesn't always pay well. These are not the books for people who don't want a little lovin' between the pages, and probably not for people that want a character to settle down with the first guy because Sookie plays the field. The same way most 20-somethings do. She may not end up with who you want- I was a little iffy on that myself- but she goes through relationship problems most women do. The wrong guy, the right guy at the wrong time, the guy your friends hate, the clingy ex. You know the types. I couldn't not mention this when it's literally a series about vampires but I really like the mythology in the books. Yes, there are some classic vampire ways: drinking blood, can't enter a house unless invited, general stuff. But there's also things like the werewolves can only have werewolf babies when it's the first child, and that bites just turn people into weird wolf/human hybrids on the full moon. And the main character can hear peoples thoughts, it's a neat dynamic. Overall, I really like the series and I'll probably read it again in a couple years. But I have other Charlaine Harris books to read before then! Have you read the Southern Vampire Mysteries?